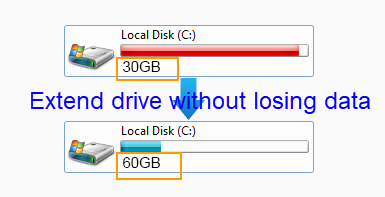 This article will tell how to increase the size of C drive on Windows Server when you receive low disk space warning message. Download IM-Magic Partition Resizer Server to fix low disk space on C drive on Windows Server 2003 2008 2012. Are you wondering if you are able to fix low disk space problem when C drive is running out of disk space on Windows Server? Do not panic! IM-Magic Partition Resizer Server, a professional partition tool for Windows Server, can help resize hard disk so that you can fix low disk space issue easily. This partition software enables you to extend partition,shrink partition and move partition without repartitioning or reformat hard disk. You can keep all data untouched by using this partition software to perform partition resizing. This partition software can work on all Windows Servers including Windows 2003, 208, 2012 and Windows SBS 2003, 2008 and more. Question: Can I Fix C Drive Low Disk Space for Server? "Today, when I started my computer I received a low disk space warning message on C drive. My computer is running on Windows 2003 operating system. The system is installed on C drive, so I am wondering if I need to reinstall system in order to fix the low disk space on C drive on Server 2003. I want to know if it is possible to resize C drive without reinstalling system." "C drive is running on low disk space on Windows Server. Can anybody tell me how to fix the problem? I want to look for a way to resize C drive without deleting or moving any data on this partition because I have installed lots of important programs on it. I tired to free up disk space on C drive, but system still reports low disk space alert message. Now, I want to look for a useful partition tool with which I can increase the size of C drive." It is true that C drive low disk space problem might affect the performance of PC or even cause system crash, so you cannot ignore the problem when receive low disk space warning on Windows Server. In order to fix the low disk space issue thoroughly, the best way is to use partition software with which you can resize hard disk and reallocate disk space. 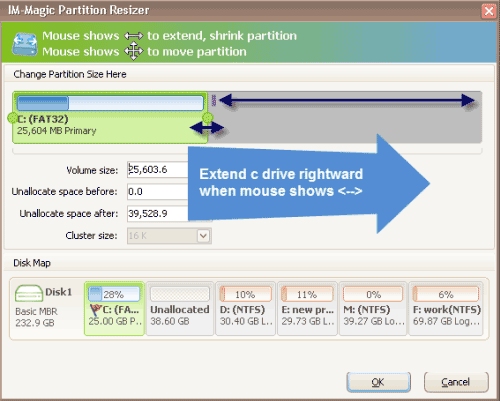 IM-Magic Partition Resizer Server has the ability to redistribute hard disk on all Windows Servers. Therefore, you can use this best Server partition software when you receive low disk space warning on any operating system. By using this partition software, you do not need to delete or move any data to free up disk space anymore. On Windows Server 2008 and later Server version, you can perform partition resizing under Disk Management. It works a partition software to help resize hard disk, but the limitation is that you are unable to move partition under Disk Management. Therefore, you may be unable to resize hard disk when the unallocated space is not adjacent to the partition you want to extend. When Disk Management cannot help resize hard disk, you still need to use the partition software with which you can reallocate disk space effectively and efficiently. Somebody may know that Diskpart command can extend partition on Windows Server, but many people find that they are unable to extend C drive. Why? Usually, if you want to extend partition by relying on Diskpart command, adjacent unallocated space is always needed. Besides, Diskpart command can only help extend data volume. Therefore, you may be unable to extend C drive by relying on Diskpart command when there is no adjacent unallocated space or when C drive is system partition. In this situation, you can rely on partition software because it can resize both system partition and data partition.